Retired Firefighter Charlie Cooperider touches up one of the areas on Cherry Street that he and others will be using to light fireworks during Wednesday’s show. Preparations for the City of Delaware’s 3,500-plus shell Fourth of July fireworks display were well underway Monday. Retired Firefighter Charlie Cooperider was mowing part of the field between the city’s recycling center and wastewater treatment facility on Cherry Street Monday afternoon. 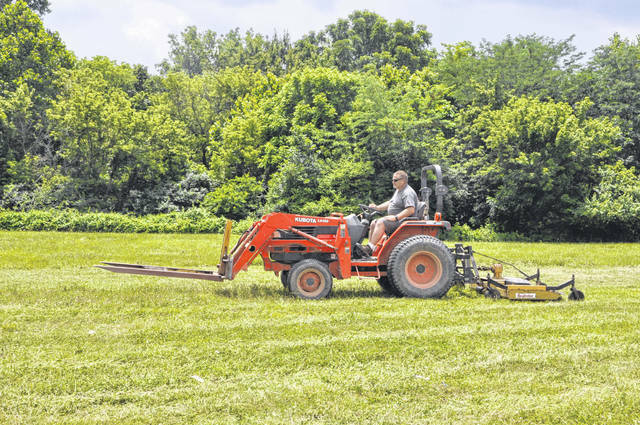 Cooperider said a public utilities crew had mowed a vast majority of the field to keep the grass low and prevent both bugs and potential fire hazards from plaguing Cooperider and the other seven men who will be running the fireworks show Wednesday. Cooperider said he and his crew will be out in the field today to prepare for the show and would be out Wednesday to load all of the fireworks ahead of the 10 p.m. show. He added that he and his team will be back out on July 5 to pick up the site and debris in the daylight. Cooperider said he’s been participating in the show for more than 26 years ever since the show was cancelled one year because of an issue with an exhibitor. “I don’t know what the issue was, but myself and (then Fire Chief Tom Macklin) both decided we weren’t going to allow that to happen again,” Cooperider said. He said he and Macklin got their assistant’s licenses after that fireworks show, and 17 years ago he got his exhibitor’s license, which he has to take an eight-hour course every year to maintain. Cooperider said the show is basically the same as shows in previous years, and he hopes more sponsors sign up to sponsor the show in the future. The National Weather Service reports that the temperature will reach more than 90 degrees on Wednesday. The high heat and humidity does actually make for a better show, Cooperider added. “Actually, the higher humidity, the brighter the shells are!” he said. The fireworks begin at 10 p.m. Wednesday. https://www.delgazette.com/wp-content/uploads/sites/40/2018/07/web1_DSC_0061.jpgRetired Firefighter Charlie Cooperider touches up one of the areas on Cherry Street that he and others will be using to light fireworks during Wednesday’s show.